The online version of this article ( https://doi.org/10.1186/s12960-019-0360-x) contains supplementary material, which is available to authorized users. However, there are still many challenges associated with CHW programmes, related particularly to their integration (or not) into health systems. 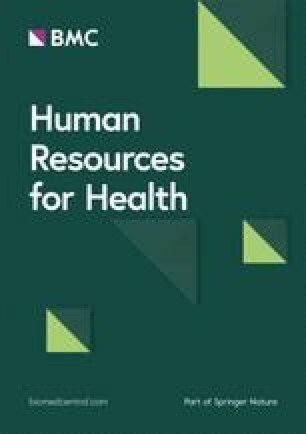 Problems with CHW remuneration, training, role clarification, referral systems, information management and provision of supplies abound [1, 2, 3]. These challenges, combined with the fact that CHWs are equipped with limited skills and often work in remote and isolated areas, point to the need for supervision systems that not only monitor performance but also provide moral and other forms of support [4, 5, 6]. Reviews examining effective designs for CHW programmes have consistently found that the quality of supervision of CHWs affects the performance of programmes [7, 8, 9, 10, 11, 12, 13]. It also affects CHWs’ sense of belonging, morale, productivity, retention, respect and credibility with other stakeholders [7, 14, 15, 16, 17, 18, 19]. Good supervision of CHWs, amongst other benefits, has the potential to improve and strengthen the relationships or interactions of CHWs with other health workers in the health system, resulting in improved trust and performance [20, 21]. Despite its importance, the literature provides little evidence of what a good supervision system for CHWs entails [1, 22, 23]. Community health workers are not a new phenomenon in South Africa. Over the years, CHWs have played a significant role in the health sector in a wide variety of areas such as maternal and child health, HIV, TB and other chronic conditions [29, 30, 31, 32]. In 2011, The National Department of Health (NDoH) in South Africa introduced the Re-engineering of Primary Health Care (RPHC) strategy as one of a set of health system reforms to address system weaknesses that resulted in the country only partially achieving the Millennium Development Goals (MDG) related to maternal, child and infant mortality; HIV; and TB [33, 34]. The RPHC strategy recommended, amongst a number of reforms, the Ward-based PHC outreach team strategy to strengthen health prevention and promotion, identify individuals and families at high risk and build links between households and health care facilities. The ward-based outreach teams (WBOT) constitute South Africa’s national CHW programme and feature in key national policy platforms including the National Development Plan 2030  and the National Health Insurance White Paper . The WBOT strategy represents the latest and most significant in a line of policy initiatives over the last decade to shape the community-based sector. The WBOT programme plays a critical role in extending PHC services to community and household level and making health accessible in terms of distance and information . Community health workers render services at household level, with limited training, resources and support. It is therefore important that CHWs are well trained, adequately supervised and supported to withstand challenges and deliver quality services [42, 43]. Although studies argue that adequate support and supervision are essential for the success and performance of CHW programmes at scale, the development of supervision systems for CHWs in policy and practice remains a challenge globally [18, 44, 45, 46]. Team leaders in their role as supervisors of CHWs are generally regarded as good supporters . Facility managers typically supervise team leaders, but their support is often perceived to be lacking. A study in Uganda found that supportive supervision and relationships between CHWs and facilities affected performance of the programme . Problematic relationships between facilities and CHWs are well described in literature [50, 51]. The root of the problem may be inadequate integration of CHW programmes into the health system; overburdened and poorly resourced facilities; conflicting interests between facilities and CHWs; weaknesses in the support and supervision of facilities themselves; and limited participation by stakeholders in the design and decision-making of the CHW programme [7, 52, 53, 54, 55]. There is a need for further research to understand factors associated with strained relationships between facilities and CHWs. Performance management has been defined as a process that is used to measure and improve the performance of workers in order to improve the performance of the organisation [56, 57, 58]. Despite efforts to improve performance of the programme through building capacity of CHWs , performance management for both CHWs and team leaders is unofficial, and the process is often unrecorded.